Pearls are one of my favorite gems. They are pretty, elegant, and feminine. I have several in the form of earrings and necklaces. Some white, some pink. I also love my Pearl of Great Price. The Bible talks about “the kingdom of heaven (being) like a man who is a dealer in search of fine and precious pearls, who, on finding a single pearl of great price, went and sold all he had and bought it.” (Matthew 13.45-46.) 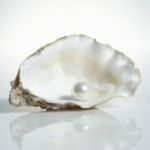 God is the Pearl in this story and, I too, would let go of everything I own if needed to to know and obey God. I am convinced that people who do not know God, or about God in a personal way, have the conception that God is a ‘kill-joy’ and means only to take away from them to make them something they do not want to be at all. In fact, sometimes, I think people see God as hating what they are and wanting them to be something completely different. I don’t think so and I think God made each of us special and loves us more than we can comprehend. He only hates the things that hurt us. The real you is what He wants you to be and we can only be that when we experience the paradox of losing ourselves to Him to find our true selves. At times I did not see the ‘broken’ me as something that needed fixed or healed by God. When we lose our lives, we find our lives in God. All of God’s Word demonstrates how much He loves us and cherishes us as the creation He made. After all, He came to Earth to die so we could live. When we choose His way – we live and thrive, when we choose against His way, we choose death. The choice is always ours to make. I choose life.